“Taking the route of Kitamae-sen cargo ship back in Edo period” This program features copper distribution in Edo period, starting Ani copper mine to Nagasaki and eventually to the Holland, to trace the route of Akita’s Ani copper which had a great influece on the world economy. Also, we found the14th owner of Osakaya. The mystery of picture scrolls, miraculously found in the owner’s house will be explained. 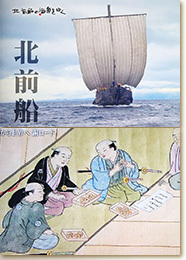 The article reports that contracts and documents which show business scale of Osakaya, a wealthy merchant along with Sumitomo, have been discovered, as well as a picture scroll which shows a process of production of Kanei Tsuho coin. When Besshi dozan copper mine celebrated 250th year anniversary of its opening, which business helped Sumitomo family establish their fortunes and fame, the article further reports the background of how Sumitomo family gained an access to Besshi copper mine and their strife with Osakaya during Genroku period. 7 pieces of historical records on Osakaya were displayed, including “dofukiyurai chusenjo emaki”, “Osakaya sumiyacho zumen”(drawing of Osakaya’s residence in Sumiyacho) and “Akita Kagoyama fukiyaezu”(drawing of smeltery in Akita Kagoyama) etc. Historical exhibition on Kagoyama smeltery, later known as Kagoyama Seirenjo, which was opened by VII Kuzaemon Seihu, the owner of Osakaya, at the request of Mr. Satake, the daimyo of Akita domain, during Edo’s Anei period.